I think that all of us that live with dogs always want things a little bit nicer and a little bit better for our canine companions. When cruising the web I came across Notes from A Cottage Industry and her solution for dog bowls. And I was quite impressed with Tracey and what she came up with. Tracey has made the Canine Water Bowl a thing of beauty. This bowl would be perfect for those of you with large dogs. Best of all, this stunning toile bowl was $9.99 at TJ Maxx. Now who says you can't have it all? A Great House Plant . . .
that is safe to have around dogs happens to be one of my favorites is . . . the Piggyback Plant! 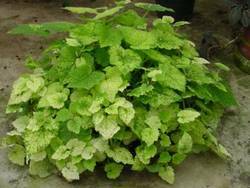 This indoor plant has proven for me to be durable and tolerant of different light conditions. What I really like about Piggy Backs is the way that they make new plants. Little baby plants develop at the base of the "mother" plants leaf, you can just pick it of, put it in the soil and you have a new plant! OK, this is a boring topic, but very important to the dog owner that wants to have a clean house. I have four Vacuums, some found, others bought and one given as a wedding present. None of which worked to our satisfaction. That is to the satisfaction of someone who has 3 Cavaliers, a Parrotlet, a few visiting canines, and a husband. That is until our good friend Sandi Mestyanek loaned us her Dyson Animal. All I can say is that we are now in love. The Dyson Animal was designed with the pet owner in mind and it definitely shows. We were able to clean tile, low Berber (why that is in a house with pets, I have no idea) carpeting, ledges, furniture, and blinds. It picked up hair, feathers, dirt and I don't want to know what else with ease and was actually fun to use. I think that every inch of our house has been vacuumed. 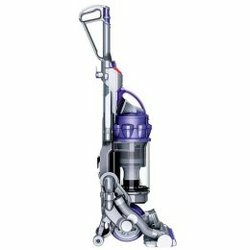 I am not excited about the $550 plus price tag, however the Dyson Animal will be a welcomed addition to our home.